The pictures of Easter Lilies from a few days ago obviously aren't the big Japanese lilies commonly sold as Easter Lilies; they're a native plant, found in their native habitat in Lowndes County, Georgia. Everybody around here recognizes them, and seems to call them either Easter Lilies, or "those lilies you see in the ditch by the road." Nobody seems to know any other name for them, neither common nor botanic. So Gretchen and I journeyed two hours south to the strange land of Gainesville, Florida, to attend the Gopher Tortoise Council spring meeting, taking a few samples of "those lilies" in hopes that the assembled botanists and biologists could identify them. And they could! Zephyranthes atamasca var. treateiae. The pictures match, right down to the pointy petals with green centers and yellow pollen. 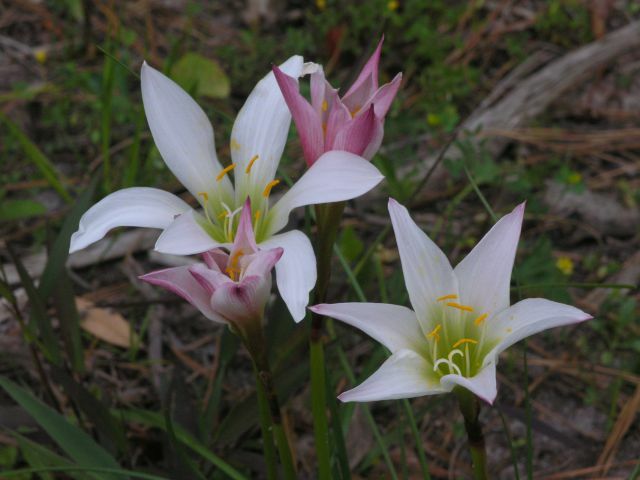 Apparently it does have a "common" name: Treat's rain lily, a variety of the Atamasco lily. Apparently the family classification for this plant has changed from Liliaceae (Linnaeus) to Amaryllidaceae (modern). So you can call it a lily or an amaryllis, and you won't be wrong. It lives in Florida, Alabama, and Louisiana. But look at the distribution map Gretchen found for Georgia. Lowndes County. That's it; nowhere else. A local forester told us last year when he saw them in our woods, "Don't assume just because you've got lots of them that they're common." Apparently not. Makes you wonder what else is lurking in the woods of south Georgia that we walk by every day and don't realize is unusual. 2. Zephyranthes treatiae S. Watson, Proc. Amer. Acad. Arts. 14: 300. 1879. Leaf blade dull green, to 4 mm wide. Spathe (1.8–)2–3.3(–3.6) cm. Flowers erect to inclined; peri-anth mostly white to pink, color deepening with age, funnelform, (6–)6.6–9.5(–11) cm; perianth tube green, (1.7–)2–3(–3.1) cm, increasing in diam., at least 1/4 perianth length, ± equaling (2/3–11/4) filament length, ca. 2/3–11/3 spathe length; tepals usually reflexed; stamens diverging, appearing equal; filaments filiform, (1.6–)2–4(–4.6) cm; anthers 3–6(–8) mm; style longer than perianth tube; stigma 3-fid, exserted more than 2 mm beyond anthers; pedicel 0–1(–1.2) cm, shorter than spathe. 2n = 24. Flowering mid winter--spring (Jan--Apr). 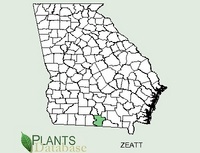 Peaty-sandy soil, usually associated with wet inlands or former pineland sites; 0--100 m; Fla., Ga. 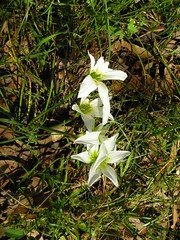 It has generally been thought that Zephyranthes atamasca and Z. treatiae are distinguishable only by differences in leaves and habitat, and that their flowers are not significantly different. However, the greater length of the perianth tube compared with that of the filaments in Z. treatiae readily separates that species from Z. atamasca.